In August 1992, Los Angeles was three months removed from the city’s worst uprisings since 1965. When four Los Angeles Police Department officers were acquitted in the roadside beating of Rodney King, frustrations that had been simmering exploded into days of looting and demonstrations. And while the literal fires resulting from rioting had flamed out by August, another was figuratively burning. It was led by former U.S. Army infantryman Tracy Lauren Marrow, also known as Los Angeles rapper Ice-T. He was a West Coast icon by the time he made the cover of Rolling Stone. There was 1987’s Rhyme Pays (gold album), 1988’s Power (platinum album), 1989’s The Iceberg/Freedom of Speech … Just Watch What You Say (gold album), and 1991’s O.G. Original Gangster (gold album). Millions of people were listening to his music. He was a movie star, too — co-starring as a police officer along with Wesley Snipes, Chris Rock, Michael Michele and Bill Nunn in 1991’s seminal New Jack City. Ice-T’s turn as Detective Scotty Appleton in the film was a precursor to his debut in 2000 as Detective Odafin “Fin” Tutuola on Law & Order: Special Victims Unit. The iconic show has been running for 17 seasons (season 18 begins Wednesday night), and a syndication juggernaut, the procedural series is pretty much never not on a screen. In May 1992, though Ice-T was an RIAA-certified superstar gangsta rapper, he had a new metal band called Body Count, and their intentionally provocative protest song was called Cop Killer. The protest was against police brutality in Southern California — the kind of relentless monitoring and beatings and shootings that groups such as N.W.A were a response to. Cop killer, but tonight we get even / Ha ha ha ha, yeah! And that was a light line. The media response was massive. Then-President George H.W. Bush called out the record company’s parent company (Time Warner). Then-Vice President Dan Quayle called the song “obscene.” Law enforcement organizations denounced it. Boycotts were called for. In July, Ice-T pulled the record, saying he would “bring it back to South Central [Los Angeles] and give it away free at concerts.” Can’t unring a bell, though. 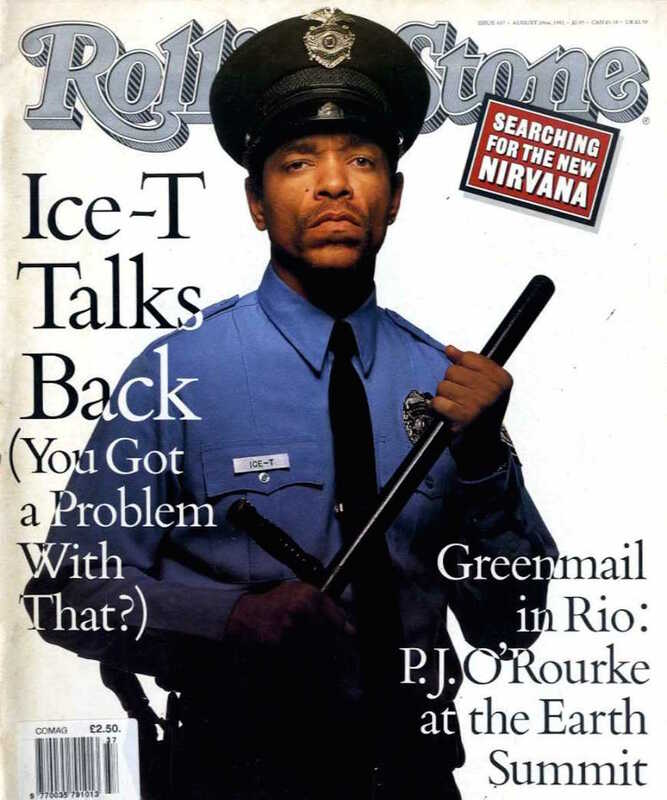 A month later, Rolling Stone, at the height of the still boiling controversy around Ice-T, featured him on the cover of its then still large-format, saddle-stitched magazine — in a full police uniform. He was holding a nightstick in a stance seemingly defiant against the waves of political pressure against him — and even in defiance of the mostly white rockers the magazine usually placed on its coveted covers. 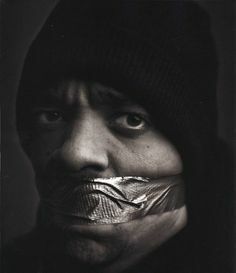 Mark Seliger, who shot the cover and at the time as Rolling Stone’s chief photographer, recalled the turbulent period in which Ice-T and rap as a whole shone a light on what was happening in the streets of Los Angeles and cities across America. That’s what Ice-T asked interviewer, Alan Light, back in 1992, and the question posed isn’t unlike the ones many are asking in 2016. “Look what’s happening with Colin [Kaepernick],” Seliger said. And what’s starting to happen with very valuable players in the world … 20 plus years later, these are questions that are being resurfaced. Seliger called Ice-T “the nicest man” and “very collaborative” and frequently speaks to their creative chemistry. And while the 1992 Rolling Stone cover was a defining moment, Seliger also recalled a later shoot for an inside story in the magazine. “S— really hit the fan,” he recalled. “I did a picture of him with a knit Berber cap and gaffer tape over his mouth. Inside the article, there is a picture of him looking through a window that’s broken and there was a reflection of the American flag. I always love that picture.” And what’s crazy is Cop Killer wasn’t the first time Ice-T had spoken out about police brutality. Take Squeeze the Trigger from Ice-T’s 1987 debut, Rhyme Pays. The song is a prime example of Ice-T holding up the mirror to society. You say I’m brutal / You should check your P.D.